StP08 Riva-Bella, K.V.U.Gr Riva-Bella, K.V.Gr Caen. 2 x R612 casemate for an assault gun. 1 x R666 infantry observation post with small turret. 1 x R626 casemate for a 7.5cm Pak with roof canopy. 6 x R622 twin group shelters. 3 x R134 ammunition bunker i. 6 x Geschützstellung (ringstands for 15.5cm guns). 4 x SK/Schartenstand & 2 x under-construction. Casemates for poss. 15.5cm guns. 1 x SK/Doppelschartenstand for a 5cm KwK. 1 x R624 machine-gun casemate with temp. front & roof plating. 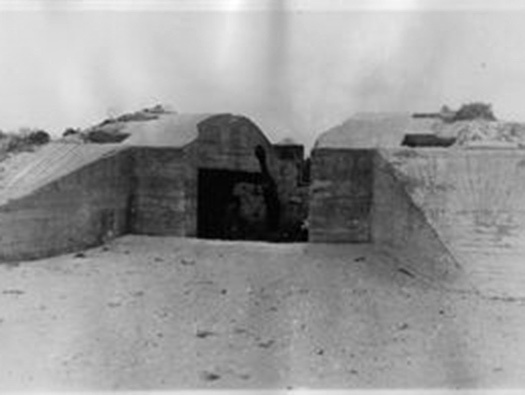 1 x Vf/MG machine-gun bunker. 1 x Flakstellung (Flak tower for 2cm Flak). 6 x 15.5cm K.418(f) guns. 1 x 7.5cm F.K38 assault gun. 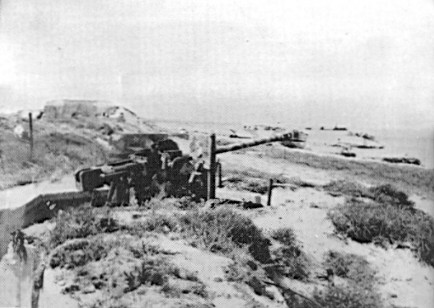 3 x 5cm KwK L/60 Pak guns. 2 x 2cm Flak (at least). 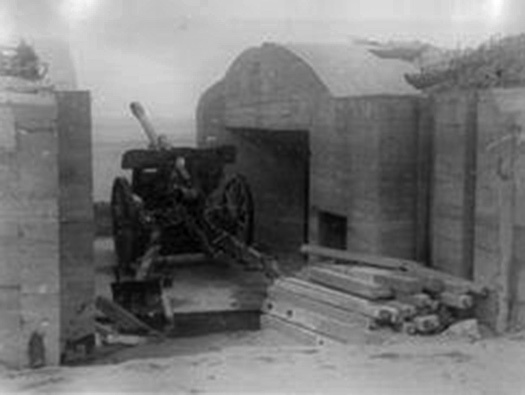 R626 casemate for a 7.5cm F.K. with roof canopy. The RAF reconnaissance visited every part of occupied Europe as it could and has a massive archive of photos. 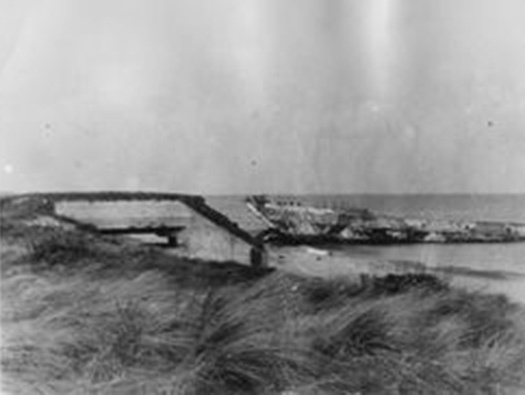 This one showing taken in November 1942 three years into the war and very few defences have been build. So everything you see from here on was probably built after this date. 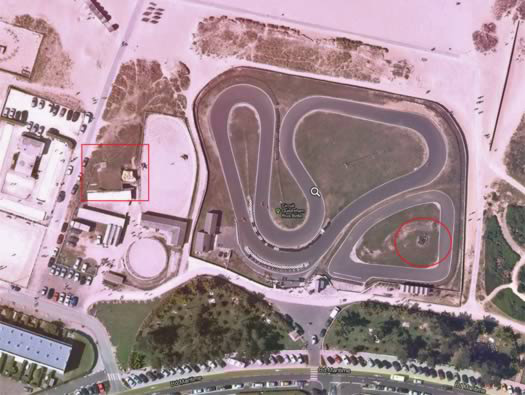 This is the area of StP08 Riva-Bella. Most of the defences were smaller Wn's, but here they were all grouped together into one large defence. 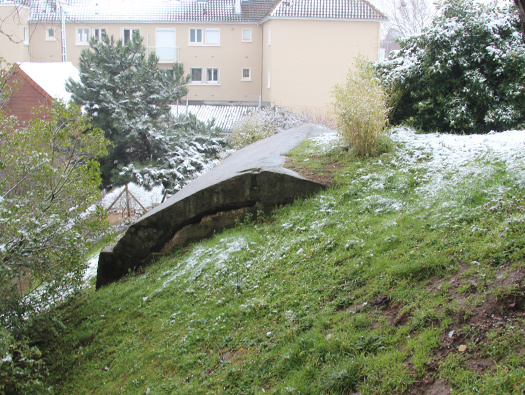 About 31 plus bunkers/casemates/emplacements. Plan of the StP (Stützpunkt). 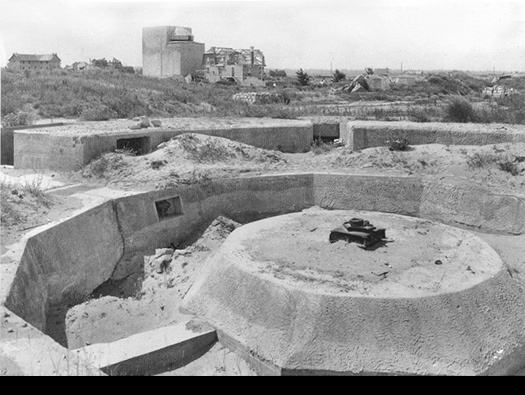 The six open emplacements (6 x Geschützstellung (ringstands for 15.5cm guns) with 3 x R134 ammunition bunker i. 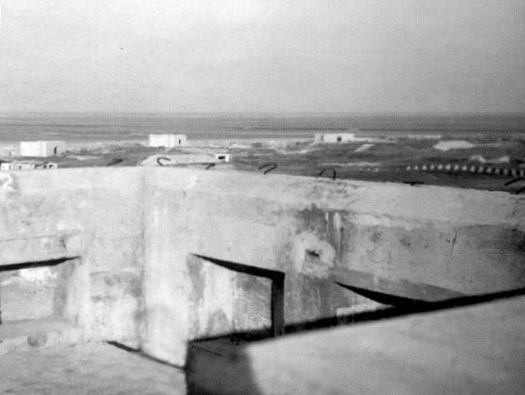 An anti-tank ditch covers the rear of the StP and a ring of Tobruks and tank turreted Tobruks. The Casino was a large interesting building but dismantled to just the ground floor and very well defended. 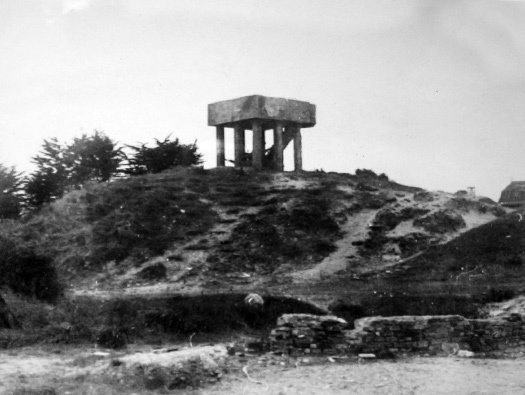 A Flak tower for a 2cm Flak behind and a fire control post (Hochleitstand). 6 x R622 twin group shelters used here as artillery guns crews quarters. Plus many other types. Geschützstellung 15.5cmk 418 (f) emplasement. A Bigot map, issued to Bigoted officers in the allied armies due to attack the French coast. To be a Bigot is to mean you were a trusted man to keep a secret. 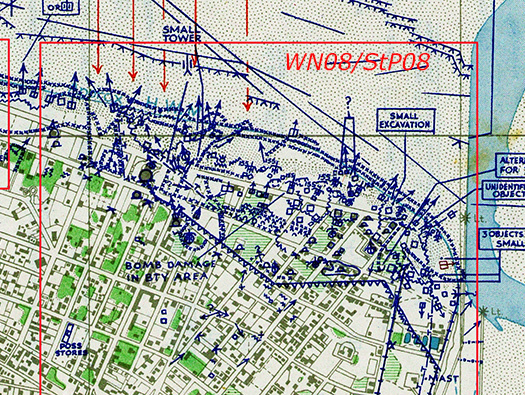 A very accurate map of the German defences and shows what Allied intelligence knew about the StP. Major Sam Wheeler a D-Day planner. 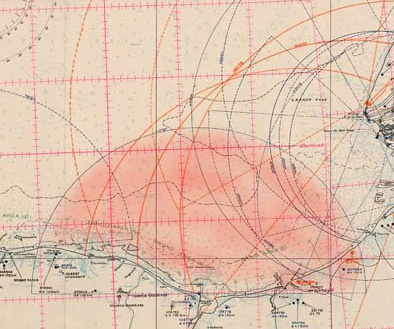 Plan of the ranges of artillery in this part of Normandy. The red area was Batterie H.K.B. 1./1260 six x 15.5cm K.418(f) guns. Geschützstellung (ringstands for 15.5cm guns). 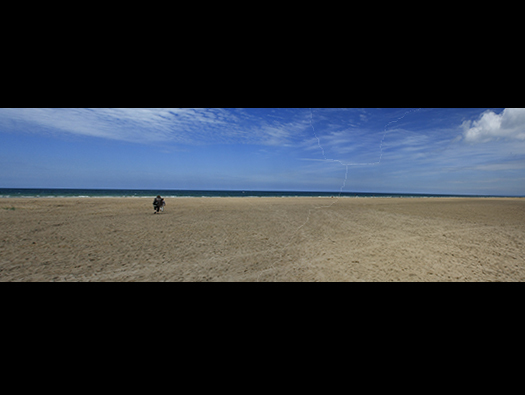 The Beach, a vast area of sand when the tide is out and ideal as a landing beach and Rommel knew it. He increased the defences here and had many more minefields laid out. 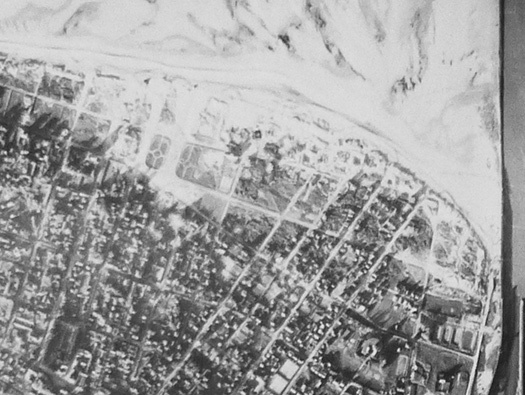 This is an air-photo of where the first remains can be found. The red circle I am not sure what this was but the red square is I believe an R134 ammunition bunker and a Tobruk defence. Plan of how the R134 was connected to the gun pits. Entrance into an R134 at Gatteville Batterie. The piece of concrete in the middle of a raceway. 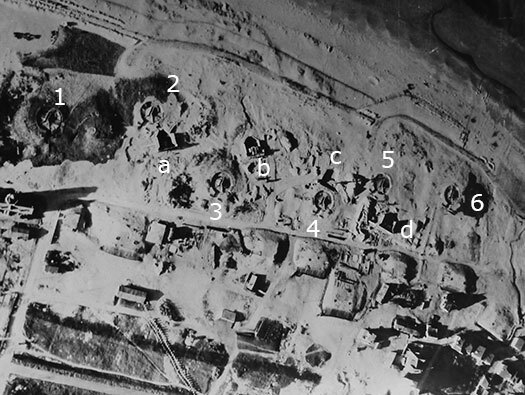 The area as it looked in 1944 allied air photo. StP08 Riva-Bella It may be the centre of a Geschützstellung (ringstands for 15.5cm guns). The turntable for the gun. 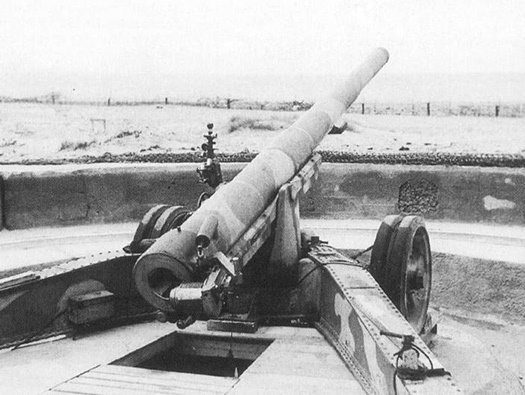 15.5cm K.418(f) guns. This is what a 15.5cm gun in its Geschützstellung. Four casemates being built lettered. I can see at least four 15.5cm guns in place. Even the crews can be seen around the guns. The passage way running right through. 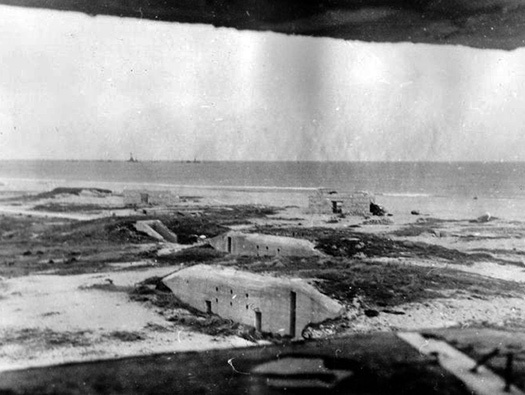 The layout of an R134 ammunition bunker serving two guns in the batterie.. Door from the passage into its ammunition room. The door fittings are of a 434PO1. 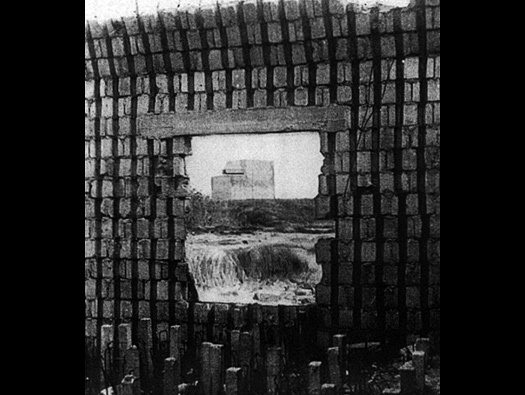 R134 ammunition bunker hooks sticking out of the concrete to attach a camouflage net..
Bunker camouflage nets being strung out. R134 ammunition bunker The entrance into the ammunition bunker..
On the top of the R134 is this camouflaged stone wall with a defensive Tobruk. One of the large 15.5cm guns ringstands. The sealed up Tobruk ring in the top. Geschützstellung (ringstands for 15.5cm guns) with the Hochleitstand (FCP) in the background. 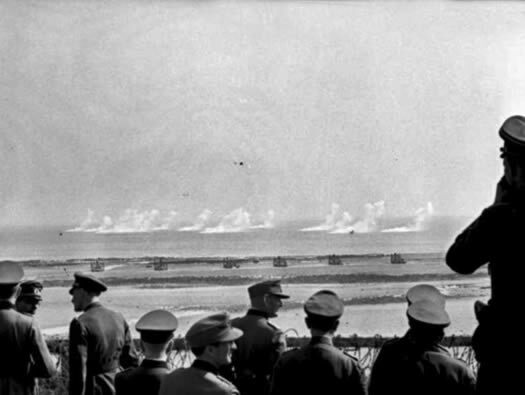 Rommel being shown early in 1944 an artillery demonstration. 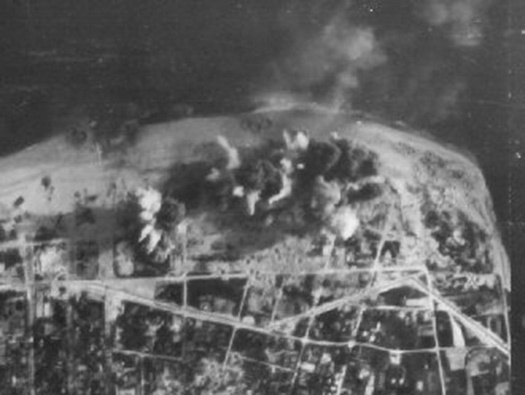 This is what the artillery could do to to an invasion fleet if they dared to come this close. 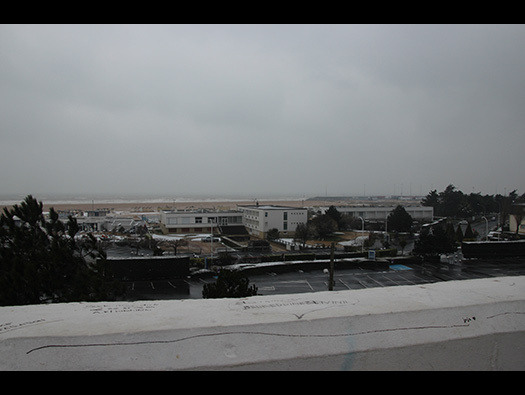 Behind Ouistreham there were several batteries like the Merville Batterie at Wn01. 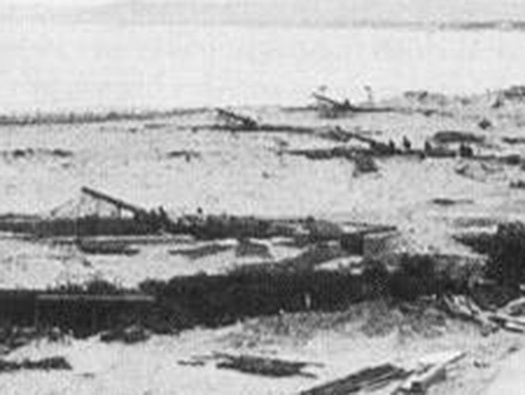 Two casemates under construction, two R622 twin group bunkers and the entrance to an R134. 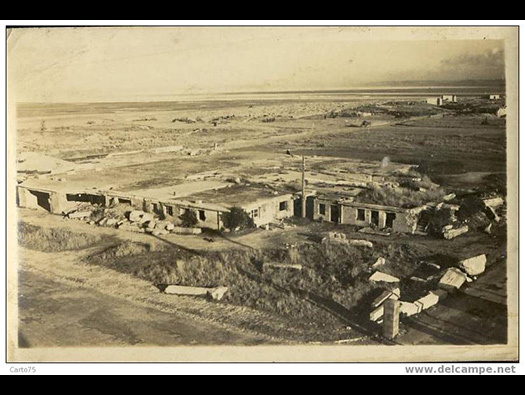 The R622´s were there to protect the guns crews from heavy bombing and as barracks. StP08 Riva-Bella H.K.B 1./1260. 6 x 15.5cm K.418(f) guns. 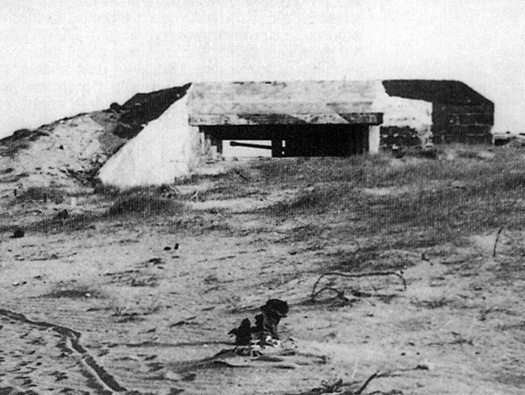 SK/Schartenstand under construction and An R622 twin group bunker. R670 casemate very like the ones here. 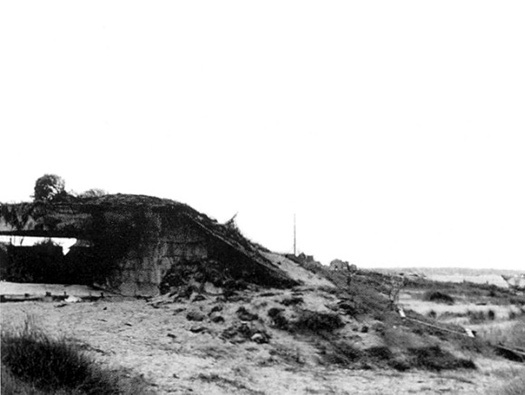 Once the Allies saw that six open emplacements were being built here they started to bomb the batterie. Casemates were then constructed to protect these guns. StP08 Riva-Bella Batterie damage report. 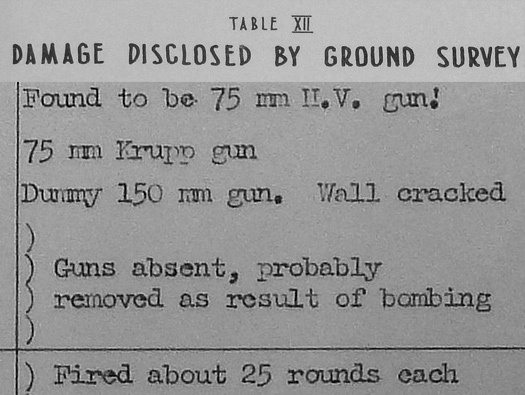 Allied bomb damage report of the Batterie..
StP08 Riva-Bella SK/Doppelschartenstand for a 5cm KwK. 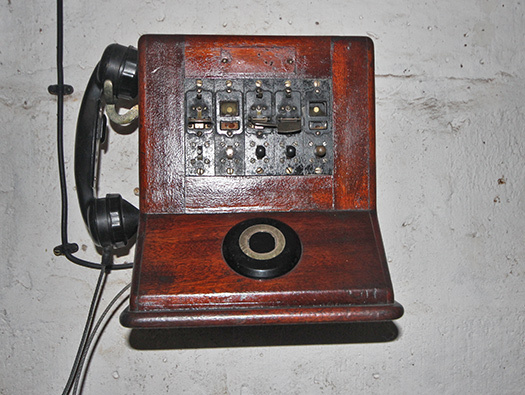 Interesting casemate. 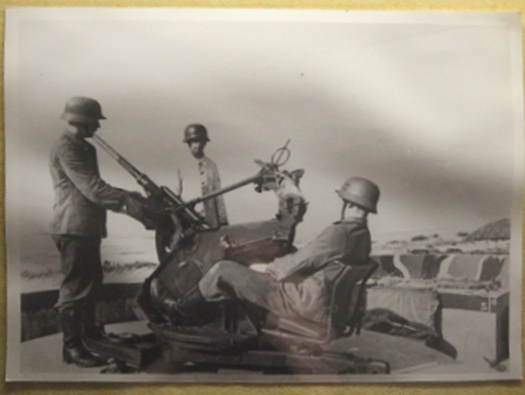 A 5cm KwK Pak gun could fire down either flank. This casemate was removed and now the Brittany Ferries port is now sitting on top of it. SK/Doppelschartenstand for a 5cm KwK plan. The new ferry port is situated right on the top of this bunker. The gun had two embrasures, one each side and could fire through either whichever was the greater threat. 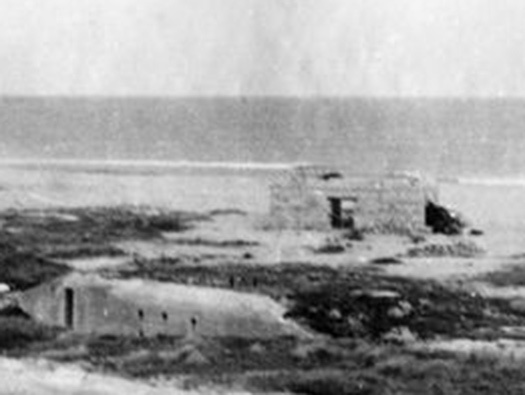 One of the many Tobruk defences. 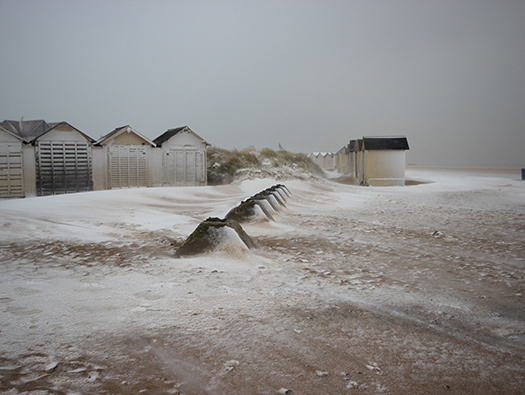 The ships behind were block-ships to protect the beach area from heavy seas after D-Day. StP08 Riva-Bella An R35 tank turret it a ´U´ Tobruk. 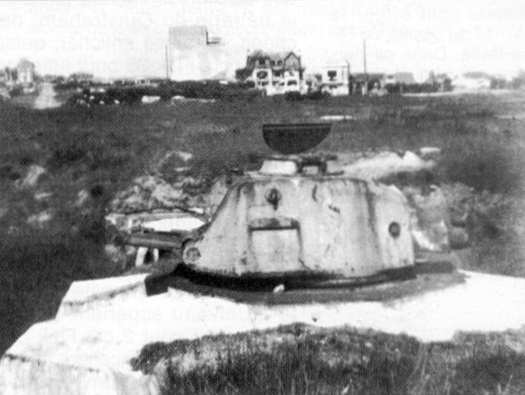 An R35 tank turret it a ´U´ Tobruk with the Fire Control Tower in the background. A ´U´ Tobruk. with its two man crew. 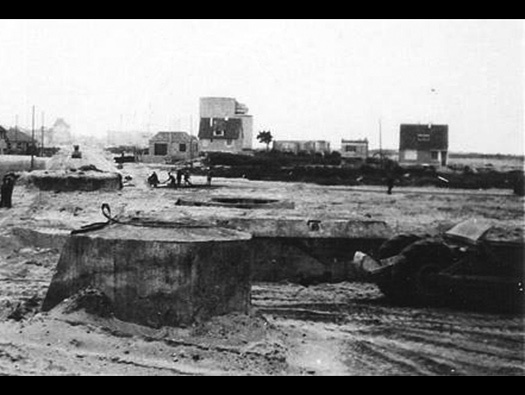 Clearing up the beach and removing the ´U´ tank turret Tobruk that was in the picture above. The road is also being built and several bunkers destroyed. Another view from the far side with the new road being laid out. Concrete gun post approximately 20' x 30' housing a German Pak 40 75mm. gun facing westward bearing 310 deg. with about a 60 deg. arc of fire. Roof 7' thick and walls to seaward about 6' thick. Sand bags to seaward up to the top of the roof, which was 10' above ground level. 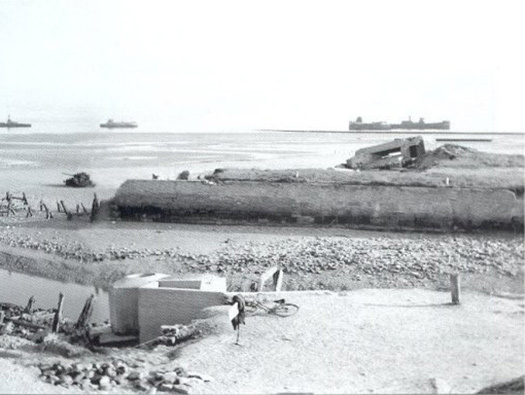 There was no damage to the gun embrasure but it was reported by a doctor who arrived at H + 2 that the crew had had been killed by a shell from a tank which exploded inside. The gun was undamaged and had fired a great deal. DEFE 2/433 [6' = 6feet]. Zig Zagging along the rear of StP08 was an anti-tank ditch. 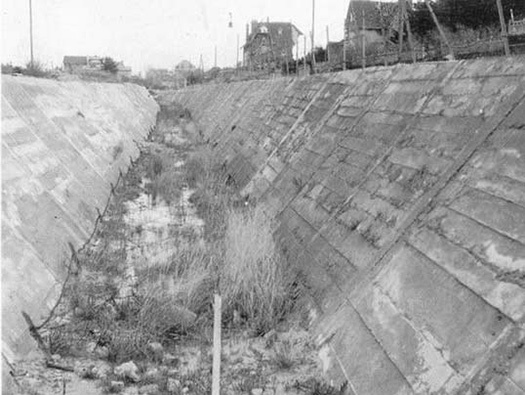 It was concrete lined and barbed wire laid at the bottom to stop infantry from getting through, also water could lay in the bottom making it a better defence. StP08 Riva-Bella Hochleitstand (Fire Control Post). This picture of the Hochleitstand is through one of the SK/Schartenstand that was under construction. 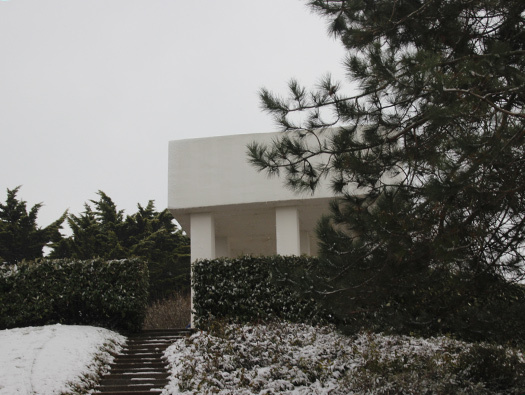 They were made from a pre-formed concrete block. The ground floor would have a close combat defence to protect the entrance. Close combat defence anti gas room and machinery room with a generator. The damage to the upper part of the tower was superficial and only needed the fragments removed and it then continued being used. The view across the town. 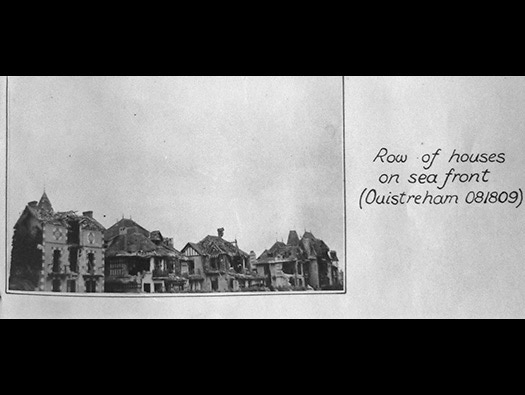 The British & French Commandos fought their way through Ouistreham from west to east. They passed by the Hochleitstand (Fire Control Post) and attacked it. Hand grenades showered from above down onto the troops. They decided that as there were no heavy weapons in the tower that it could be bypassed and left to follow up troops. 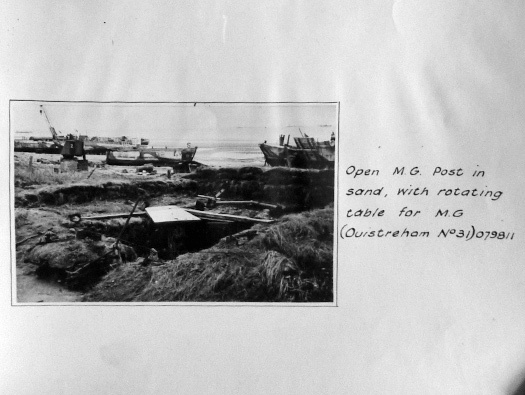 It was not until the 9th June that Lieutenant Bob Orrell o the Royal Engineers was ordered to investigate the bunker. He and three Engineers set off explosives to blow open the door. Then the the Germans inside surrender. 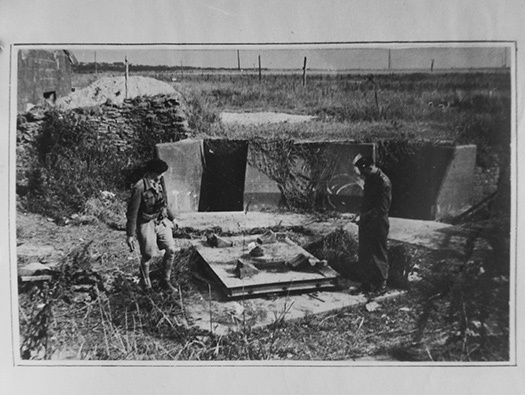 Two Officers and 50 men left the bunker. A stick grenade being thrown. Lufterraum, anti gas room. By rotating the hand pump, air is sucked in from outside, air that could be heavy with gas. This passes through charcoal filters to remove any impurities. Then the clean air is circulated around the bunker via pipes laid into the concrete walls. The internal air is pressurised to above the outside air pressure and that with all doors closed (doors have rubber seals around them) stops the ingress of gas. Close combat defence 483P2 type. The stairs to the ready room, officers room and ammunition. K98 standard issue German rifle. Plans, radio, information and ammunition room. Funk, Nachrichenraum, Planraum and munitions. Speaking tubes. As on old ships and aircraft. Tubes running throughout the bunker from floor to floor can be used to communicate. 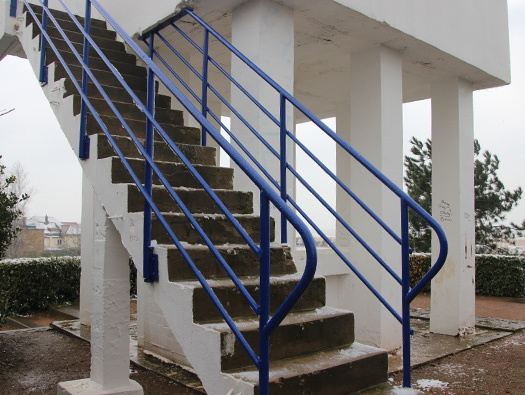 Stairs up to the top floor. On the back wall is a slot for the radio aerial fitting and on the landing a B17 propeller. The view across to the port. The steel ladder rungs up to the Flak position on the roof. Also all ammunition would have to be carried the five floors and then onto the roof by hand. The 2cm Flak 38 actually on the roof. The concrete pre cast stairs each piece numbered in Roman Numerals. DEFE2/487 Air attacks reports by Prof. S Zukerman, Maj. Anderson & others. StP08 Riva-Bella Plans of emplacements around the StP. After the landings, Allied intelligence parties were sent to France to look at all the German defences, asses battle damage, bring back any secrets. This was a plan from one of those parties a Maj. Anderson. Prof Zukerman was Winston Churchill's science adviser. StP08 Riva-Bella Flak tower for a 2cm Flak 30. The 500 strong Commando left their Forming up Point (FOP) and lead by the Free French Commando under Commander Kieffer lead the way. They were helped by a French Gendarme and by passed many defences to get to their target. 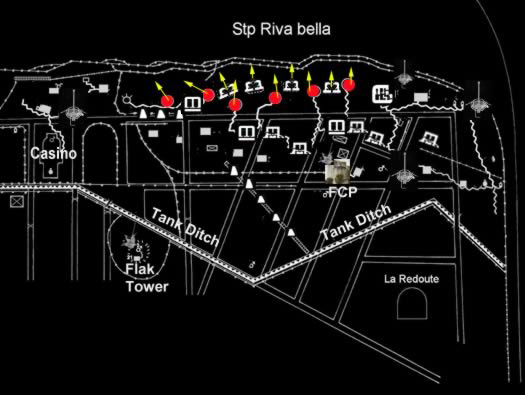 The Commando dropped their rucksacks and started to cross the anti-tank ditch (the French Commando started to attack the Casino).The rest of the Commando assaulted A major defence position which was silenced by machine gun, mortar and a well aimed Piat A/T weapon. 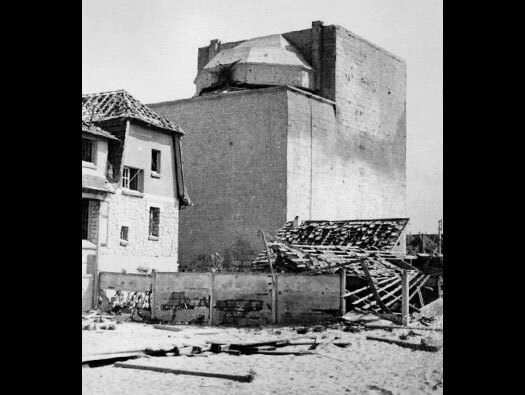 The Flak tower with a 2cm AA gun sat on its eight legs fired down on them, so the units mortars brought down on the tower, silenced it. 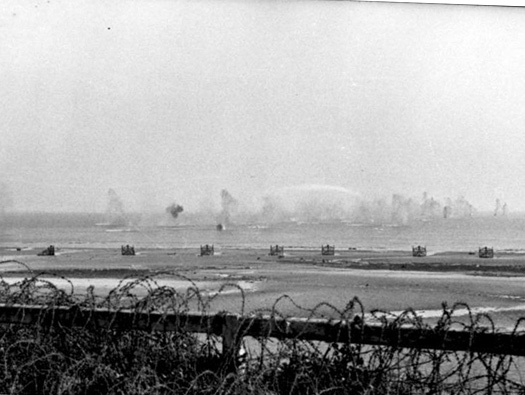 The batterie position was then rapidly cleared of enemy and the Commandos continued on to Pegasus Bridge (Wn13 Pont sur le Canal) and across to their defence positions the ridge on the the east side of the Orne River. Commando Papers, D-Day Museum Archive Portsmouth. A French Gendarme at Barneville (Manche). 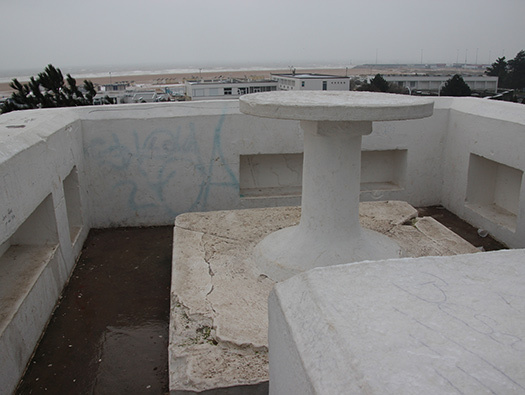 On the top where a 2cm Flak 30 would sit on the concrete square base. The view out to sea. With a 360° view and with the other 2cm Flak 30 on top of the fire control post, the cross fire could be devastating to a low level fighter..
Wellblech shelter for the guns crew. StP08 Riva-Bella 5cm Pak L/60. In its ringstand and set out somewhere on the left flank of the defence. 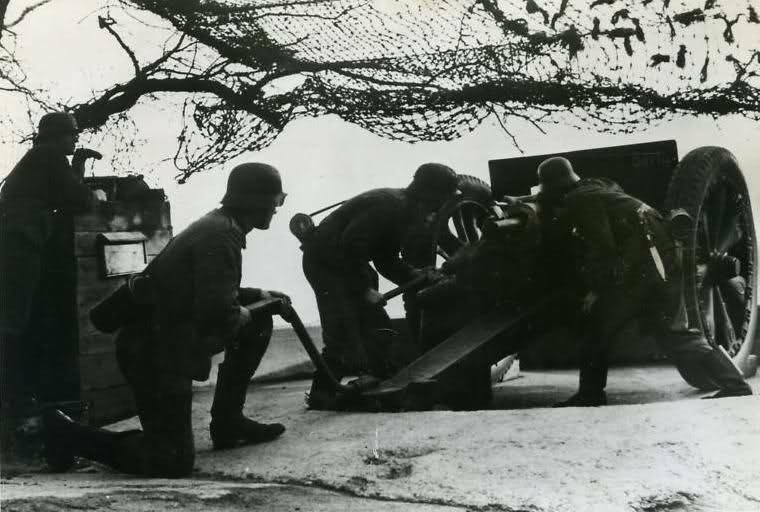 This could be the gun that the French Commandos attacked on D-Day. Ringstand for a 5cm KwK gun. 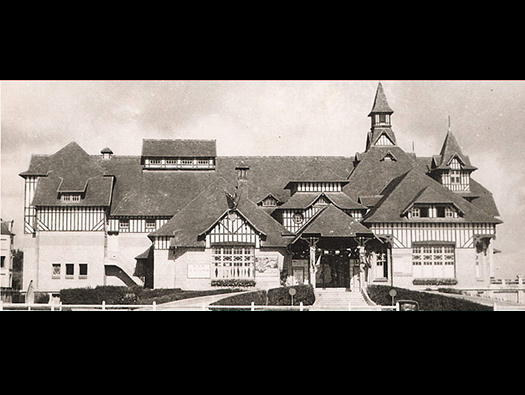 The original Riva-Bella Casino prior to the war. 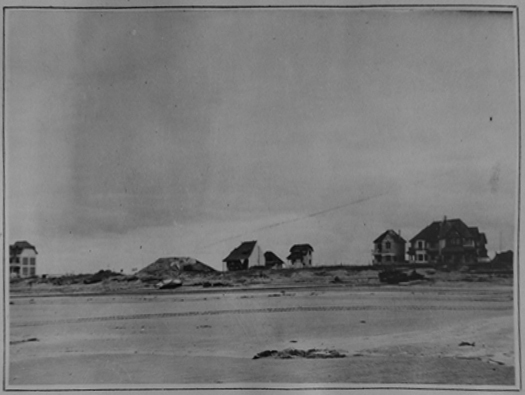 This is how it looked after D-Day, the top of the casino was demolished and then fortified. At least one ´U´ R35 tank turret Tobruk and a 2cm Flak 30. Plan of a ´U´ Tobruk. ´U´ R35 tank turret Tobruk. 1er Battalion de Fusiliers Marines Commandos. 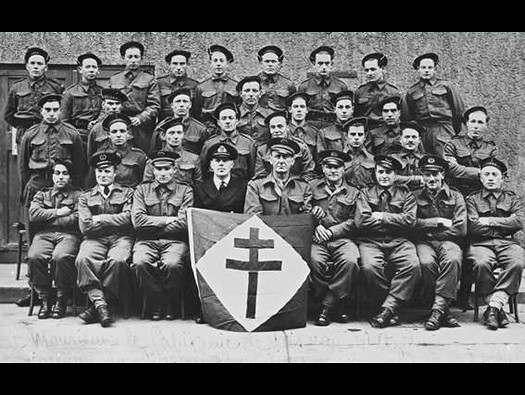 Formed in March 1941 and became "Commandos Français" and were tasked on D-Day to take StP08 and bunkers around the Casino. 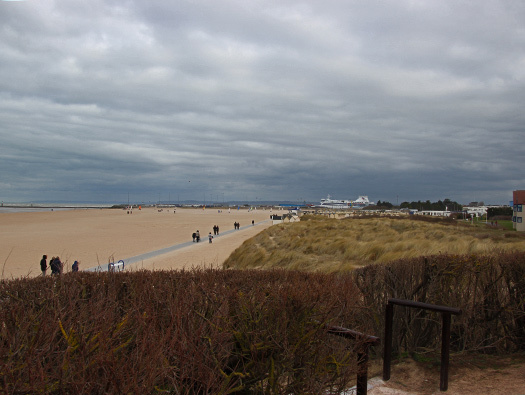 They landed on Sword beach and moved eastwards. 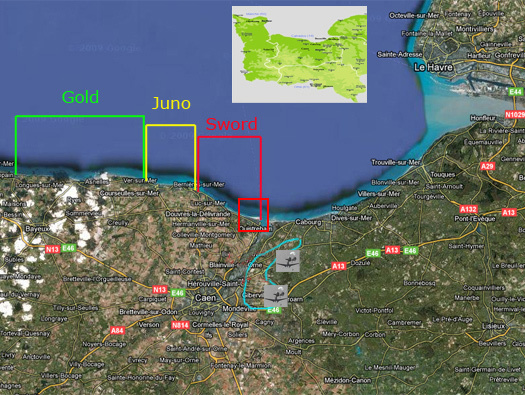 The route they took to take Ouistreham. Commandos moving south for Pegasus Bridge. Yellow lines where the Dragons teeth were laid out. StP08 Riva-Bella R626 casemate for a 7.5cm F.K. 231(f) without roof canopy. The steel canopy should have been an 845P6 but was never fitted. R626 at Wn10 showing the steel roof.. Crew room, gas lock, close combat defence, gun room and under the gun room an ammunition room. The 7.5cm F.K. 231(f) in place. 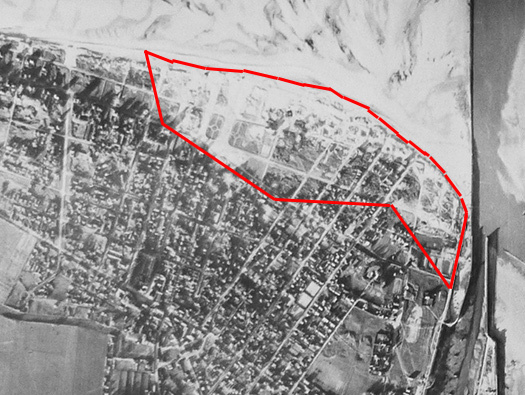 Plan of the defensive fire power covering the beach..